"Empowerment evaluation was to be of the people, for the people, and very much by the people. Our role as evaluators was to be a critical friend, a coach, and a source of technical assistance when it was requested by the self-evaluating communities and organizations. No wonder that in 1993 ‘‘conversations and arguments spilled out into the hallways’’...Read this 2015 edition, particularly for readers new to evaluation who want, in one place, a compendium of what empowerment evaluation is about, a statement of its principles, a set of case examples in diverse settings, and an understanding of where Fetterman, Kaftarian, and Wandersman are at now in their thinking...Splendidly, the results of more than 25 years of dedicated hard work and diligent thought are being shared with us. My recommendation remains, unequivocally and appreciatively: This book belongs on our shelves. Get it, read it, and, as appropriate, use it." 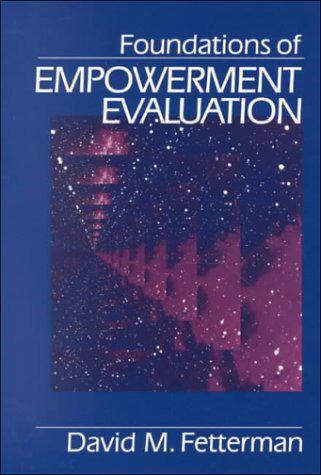 "Since its introduction by David Fetterman in 1994, empowerment evaluation has spread like wildfire across the globe. From disadvantaged schools and communities to NASA and to corporate offices in South Africa, the 10 principles of empowerment evaluation are being embraced and applied to foster self-evaluation and self-determination. What is it about empowerment evaluation that appeals so much to evaluation clients and stakeholders from all walks of life? The answer lies in this new volume, the most comprehensive, readable, and up-to-date treatment of this evaluation approach. I highly recommend this text to practicing evaluators, evaluation scholars, and instructors and students interested in learning about new evaluation theories for improving practice and learning to conduct effective empowerment evaluations." "In Empowerment Evaluation in the Digital Villages: Hewlett Packard’s $15 Million Race Towards Social Justice, David M. Fetterman presents the story of three digital villages working towards “bridging the digital divide.” That is, three diverse, low-income communities, using substantial grant funding from Hewlett Packard, embarked on projects aimed to help their members access and productively use the Internet and technology...The book is highly inspirational, showing that large-scale change is possible while viewing it through a realistic lens to see that it is also challenging and takes time...Empowerment Evaluation in the Digital Villages is a well-organized book that makes impressive use of central imagery to engage readers. It did a rather good job of convincing me that empowerment evaluation would be a positive force on many communities." "Fetterman explains in sequential fashion how to do an ethnographic study. He describes ethnography as "the art and science of describing a group or culture" (p. 11) The first step in the process is for the researcher to enter the field of study with an open mind. In attempting to describe a setting, there is no one acceptable standard. Multiple interpretations of reality exist. A study is one person's view of a given group, at a particular time. Although this limitation is a given, an ethnographer should seek to be holistic in presenting a study's findings (p. 21). An ethnographic study would include both structure and function. Structure is the social structure or configuration of the group. Function is the social relations among group members. Like systems theory, relationships are significant components of an ethnographic study. Symbolic communication is significant in revealing what is important to the people being studied. As an observer, a researcher using this approach is a human instrument. There are some biases, but the more experience one develops, the better one can develop his or her skills of observation. Fetterman goes on to talk about the difference between writing good field notes and writing the final report. In all the book clearly shows how to go about the process of doing an ethnographic study." -- Dr. W.G. Covington, Jr.
Fetterman, D.M., Rodriguez-Campos, L., and Zukoski, A. (2017). Collaborative, Participatory, and Empowerment Evaluation: Stakeholder Involvement Approaches. New York: Guilford Publications. Fetterman, D.M., Kaftarian, S., and Wandersman, A. (2015). Empowerment Evaluation: Knowledge and Tools for Self-assessment, Evaluation Capacity Building, and Accountability. Thousand Oaks, CA: Sage. Fetterman, D.M. (2013). Empowerment Evaluation in the Digital Villages: Hewlett-Packard's $15 Million Race Toward Social Justice. Stanford: Stanford University Press. Fetterman, D.M. (2010). Ethnography: Step by Step (Third Edition). Thousand Oaks, CA: Sage. Fetterman, D.M. (1989). Ethnography: Step by Step. Newbury Park, CA: Sage Publications (13th printing). Fetterman, D.M. (in press). Empowerment Evaluation. The SAGE Encyclopedia of Educational Research, Measurement, and Evaluation. Thousand Oaks, CA: Sage. Fetterman, D.M. and Ravitz, J. (in press). Evaluation Capacity Building. The SAGE Encyclopedia of Educational Research, Measurement, and Evaluation. Thousand Oaks, CA: Sage. Fetterman, D.M. (in press). Empowerment Evaluation: Linking Theories, Principles, and Concepts to Practical Steps. In Secolsky, C. and Denison, D.B. (eds.) Handbook on Measurement, Assessment, and Evaluation in Higher Education (2nd edition). New York: Routledge. Fetterman, D.M. (in press). Transformative Empowerment Evaluation and Freireian Pedagogy: Alignment with an Emancipatory Tradition. In Patton, M.Q. (ed.) Pedagogy of Evaluation: The Cpntributions of Paulo Freire to Global Evaluation Thinking and Practice. New Directions for Evaluation. San Francisco: Jossey-Bass. Fetterman, D.M. (2015). Empowerment Evaluation. International Encyclopedia of the Social and Behavioral Sciences, 2nd edition. Fetterman, D.M. (2015). Ethnography. International Encyclopedia of the Social and Behavioral Sciences, 2nd edition. Mansh, M., White, W., Gee-Tong, L., Lunn, M., Obedin-Maliver, J., Stewart, L., Goldsmith, E., Brenman, S., Tran, E., Wells, M., Fetterman, D.M., Garcia, G. (2015). Sexual and Gender Minority Identity Disclosure During Undergraduate Medical Education: "In the Closet" in Medical School. Academic Medicine, 90(5):634-644. Obedin-Maliver, J., Goldsmith, E.S., Stewart, L., White, W., Tran, E., Brenman, S., Wells,M., Fetterman, D.M., Garcia, G., Lunn, M.R. (2011). Lesbian, Gay, Bisexual, and Transgender-Related Content in Undergraduate Medical Education. JAMA, 306(9):971-977. Fetterman, D.M., Deitz, J., and Gesundheit, N. (2010). Empowerment evaluation: A collaborative approach to evaluating and transforming a medical school curriculum. Academic Medicine, 85(5):813-820. Fetterman, D.M. (2009). Empowerment evaluation at the Stanford University School of Medicine: Using a Critical Friend to Improve the Clerkship Experience. Ensaio: Avaliação e Políticas Públicas em Educação. Rio je Janeiro, 17(63):197-204. Fetterman, D. and Wandersman, A. (2007). Empowerment Evaluation: Yesterday, Today, and Tomorrow. American Journal of Evaluation, 28(2):179-198. Fetterman, D.M. (2004). Empowerment Evaluation's Technological Tools of the Trade. Harvard Family Research Project. The Evaluation Exchange, X 3, p. 8-9. Fetterman, D.M. (2003). Ethnography. In Lewis-Beck, M., Bryman, A., and Liao, T.F. (eds. ), Encyclopedia of Research Methods for the Social Sciences. Thousand Oaks, CA: Sage. Fetterman, D.M. (in press). Qualitative Approaches to Evaluating Education. In Burgess, R. (ed.) Encyclopedia of Social Science Research. London, England: Falmer Press. Fetterman, D.M. (2003). Fetterman-House. A Process Use Distinction and a Theory. In Christie, C.A. (ed.) The Practice-Theory Relationship in Evaluation. No. 97, Spring. San Francisco: Jossey-Bass. Fetterman, D.M. (2003). Empowerment Evaluation Strikes a Responsive Chord. In S. Donaldson & Scriven, M. (Eds.) Evaluating social programs and problems: Visions for the new millennium. Hillsdale, NJ: Erlbaum. Fetterman, D.M. and Bowman, C. (2001). Experiential Education and Empowerment Evaluation: Mars Rover Educational Program Case Example. Journal of Experiential Education. Fetterman, D.M. (2002). Book Review of Qualitative Research: A Personal Skills Approach by Gary D. Shank, Education Review. Fetterman, D.M. (1999). Reflections on Empowerment Evaluation: Learning from Experience. Canadian Journal for Program Evaluation, Special Issue, pp. 5-37. Fetterman, D.M. (1998). Teaching in the Virtual Classroom at Stanford University. The Technology Source. Fetterman, D.M. (1998). Webs of Meaning: Computer and Internet Resources for Educational Research and Instruction. Educational Researcher, 27(3):22-30. Fetterman, D.M. (1997). Empowerment Evaluation: A Response to Patton and Scriven. Evaluation Practice, 18(3):253-266. Fetterman, D.M. (1997). A Response to Sechrest's Review of Empowerment Evaluation. Environment and Behavior, 29(3):427-436. Fetterman, D.M. (1997). Ethnography. In Bickman, L. and Rog, D. (eds.) Handbook of Applied Social Research Methods. Thousand Oaks, CA: Sage. Fetterman, D.M. (1997). Empowerment Evaluation and Accreditation in Higher Education. In Chelimsky, E. and Shadish, W. (eds.) Evaluation for the 21st Century: A Resource Book. Thousand Oaks, CA: Sage. Fetterman, D.M. (1997). Videoconferencing Over the Internet. Qualitative Health Research, 7(1):154-163. Fetterman, D.M. (1996). Empowerment Evaluation: An Introduction to Theory and Practice. In Fetterman, D.M., Kaftarian, S., and Wandersman, A. (eds.) Empowerment Evaluation: Knowledge and Tools for Self-Assessment and Accountability. Newbury Park, CA: Sage. Fetterman, D.M. (1996). Conclusion: Reflections on Emergent Themes and Next Steps. In Fetterman, D.M., Kaftarian, S., and Wandersman, A. (eds.) Empowerment Evaluation: Knowledge and Tools for Self-Assessment and Accountability. Newbury Park, CA: Sage. Fetterman, D.M. (1996). Ethnography in the Virtual Classroom. Practicing Anthropology, 18(3):2, 36-39. Fetterman, D.M. (1995). Empowerment Evaluation: A Learning Tool for Systemic Change. In Jenlink, P. (ed. ), Systemic Change: Touchstones for the Future School Palatine, IL: IRI/Skylight Publishing. Fetterman, D.M. (1995). 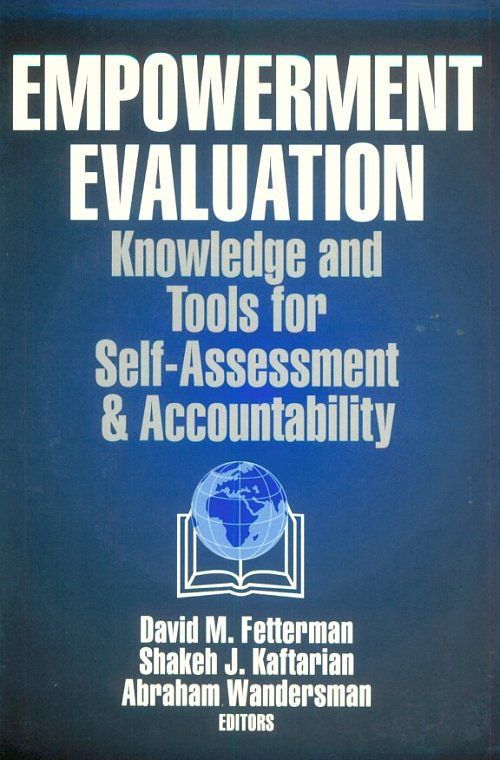 In Response to Dr. Daniel Stufflebeam's: "Empowerment Evaluation, Objectivist Evaluation, and Evaluation Standards: Where the Future of Evaluation Should Not Go and Where It Needs to Go," Evaluation Practice, June 1995, 16(2):179-199. Fetterman, D.M. (1994). Ethnographic Evaluation in Education. In T.Husen and T.N. Postlethwaite, The International Encyclopedia of Education. Oxford, England: Pergamon Press. Fetterman, D.M. (1994). Gifted and Talented Education Program Evaluation. In Sternberg, R.J. (ed.) Encyclopedia of Human Intelligence. New York, NY: Macmillan Publishing Company. Fetterman, D.M. (1994). The Terman Study. In Sternberg, R.J. (ed.) Encyclopedia of Human Intelligence. New York, NY: Macmillan Publishing Company. Dennis, M.L., Fetterman, D.M. and Sechrest, L. (1994). Integrating Qualitative and Quantitative Evaluation Methods in Substance Abuse Research. Evaluation and Program Planning, 17(4):419-427. Fetterman, D.M. (1994). Keeping Research on Track. New Directions for Program Evaluation. No. 63, Fall. San Francisco, CA: Jossey-Bass, pp. 103-105. Fetterman, D.M. (1994). Steps of Empowerment Evaluation: From California to Cape Town. Evaluation and Program Planning, 17(3):305-313. Fetterman, D.M. (1994). Empowerment Evaluation. Presidential Address. Evaluation Practice, 15(1):1-15. Fetterman, D.M. (1993). Empowerment Evaluation (Theme for 1993 Annual Meeting), Evaluation Practice, 14(1):115-117. Fetterman, D.M. (1993) Evaluate Yourself: Executive Summary. Storrs, CT: National Research Center on the Gifted and Talented. Fetterman, D.M. (1992) Investigative Evaluation and Litigation. In N. Smith (Ed.) Varieties of Investigative Evaluation. New Directions for Program Evaluation. San Francisco, CA: Jossey-Bass, No. 56, Winter 1992, pp. 15-28. Fetterman, D.M. (1993). Confronting a Culture of Violence: South Africa Nears a Critical Juncture. San Jose Mercury, October 3, pp. 1C, 4C. Fetterman, D.M. (1993). Ethnography and Policy: A Catalytic Combination for Change. In E. Jacob and C. Jordan, Minority Education: Anthropological Perspectives. New Jersey: Ablex. Fetterman, D.M. (1992). Hevrah: Our Intellectual Community. Anthropology and Education Quarterly, 23(4):271-274. Fetterman, D.M. (1992) Theory in Evaluation: We Think, Therefore We Theorize (An Ethnographer's Perspective). In Chen, H. and Rossi, P.H. (Eds.) Using Theory to Improve Program and Policy Evaluations. New York, NY: Greenwood Press. Fetterman, D.M. (1992) Evaluate Yourself. Storrs, CT: National Research Center on the Gifted and Talented. Fetterman, D.M. (1991). Auditing as Institutional Research: A Qualitative Focus. In Fetterman, D.M. (Ed.). Using Qualitative Methods in Institutional Research, New Directions for Institutional Research. San Francisco: Jossey-Bass. Fetterman, D.M. (1991) Qualitative Resource Landmarks. In Fetterman, D.M. (ed.). Using Qualitative Methods in Institutional Research, New Directions for Institutional Research. San Francisco: Jossey-Bass. Fetterman, D.M. (1991). A Walk Through the Wilderness: Learning to Find Your Way. In Shaffir, W.B. and Stebbins, (Eds.) Experiencing Fieldwork: An Inside View of Qualitative Research. Newbury Park, CA: Sage. Fetterman, D.M. (1991). Evaluation in Multi-Site and Multi-Focus Projects. Revitalizing Rural America: New Strategies for the Nineties. Georgia Center for Continuing Education. Athens, GA: The University of Georgia. Fetterman, D.M. (1990). Ethnographic Auditing. In Tierney, W.G. (ed.) Assessing Academic Climates and Cultures, New Directions for Institutional Research. San Francisco: Jossey-Bass, 68:19-34. Fetterman, D.M. (1990). Health and Safety Issues: Colleges Must Take Steps to Avert Serious Problems. The Chronicle of Higher Education, March 21, A48. Fetterman, D.M. (1989). Anthropology Can Make a Difference. In Trueba, H., G. Spindler, and Spindler, L. (Eds.) What Do Anthropologists Have to Say About Dropouts? New York, NY: Falmer Press, 1989. Fetterman, D.M. (1989). Ethnographer as Rhetorician: Multiple Audiences Reflect Multiple Realities. Practicing Anthropology, 11(2):2, 17-18. Fetterman, D.M. (1988). Stanford Special Review on Health and Safety Phase II: A Report on Allegations. Internal Audit Department. Stanford, CA: Stanford University. Fetterman, D.M. (1988). Qualitative Approaches to Evaluating Education. Educational Researcher, 17(8):17-23. Fetterman, D.M. (1988). Gifted and Talented Education. In Gorton, R.A., Schneider, G.T., and Fisher, J.C. (Eds.) Encyclopedia of School Administration and Supervision. Phoenix, AZ: Oryx Press. Fetterman, D.M. (1987). A Rainbow of Qualitative Approaches and Concerns. In Fetterman, D.M. (Ed. ), Perennial Issues in Qualitative Research, Education and Urban Society (Special Topic Edition), 20(1):3-8. Fetterman, D.M. (1987). A National Ethnographic Evaluation of the Career Intern Program (an alternative high school program for dropouts). In B. Wulff and S.J. Fiske (ed.) Anthropological Praxis: Translating Knowledge into Action. Boulder, CO: Westview Press, 1987. Fetterman, D.M. (1987). Ethnographic Educational Evaluation. In G.D. Spindler (Ed. ), Interpretive Ethnography of Education: At Home and Abroad. New Jersey: Lawrence Erlbaum Associates, pp. 81 -106. Fetterman, D.M. (1986). The Role of Informed Criticism in Scholarly Review. Evaluation and Program Planning, 9:183-4. Fetterman, D.M. (1986). Gifted and Talented Education: A National Test Case in Peoria. Educational Evaluation and Policy Analysis, 8(2):155-166. Fetterman, D.M. (1986). Conceptual Crossroads: Methods and Ethics in Ethnographic Research. In D.D. Williams, (Ed.) Naturalistic Evaluation, New Directions for Program Evaluation. San Francisco, CA: Jossey-Bass Inc., pp. 23-36. Fetterman, D.M. (1986). Operational Auditing in a Teaching Hospital: A Cultural Approach, Internal Auditor, 43(2):48-54. Fetterman, D.M. (1986). Gifted and Talented Education in the Soviet Union, Gifted Education International, 5(1):180-183. Fetterman, D.M. (1986). Beyond the Status Quo in Ethnographic Educational Evaluation. In D.M. Fetterman and M.A. Pitman (Eds. ), Educational Evaluation: Ethnography in Theory, Practice, and Politics. Newbury Park, CA: Sage Publications, pp. 13-20. Fetterman, D.M. (1986). The Evolution of a Discipline. In D.M. Fetterman and M.A. Pitman (Eds. ), Educational Evaluation: Ethnography in Theory, Practice, and Politics. Newbury Park, CA: Sage Publications, pp. 215-222. Fetterman, D.M. (1986). Evaluating Organizational Culture in a Teaching Hospital: The Use of Cultural Concepts and Techniques. In K. Sedgwick (Ed. ), Association of College and University Auditors. Logan, Utah: Utah State University. Fetterman, D.M. (1985). Focusing on a Cross-Cultural Lens in Evaluation. Evaluation Research Society Newsletter, Invited special topic article, 9(2):3-5. Fetterman, D.M. (1984). Doing Ethnographic Educational Evaluation. In D.M. Fetterman (Ed. ), Ethnography in Educational Evaluation. Newbury Park, CA: Sage Publications, Inc.
Fetterman, D.M. (1984). Guilty Knowledge, Dirty Hands, and Other Ethical Dilemmas: The Hazards of Contract Research. Human Organization, 42 (3):214-224. Reprinted in Conner, R.F. (Ed.) Evaluation Studies Review Annual, Vol. 9, 1984. Also reprinted in Fetterman, D.M. (Ed.) Ethnography in Educational Evaluation. Newbury Park, CA: Sage Publications, Inc.
Fetterman, D.M. (1982). Ibsen's Baths: Reactivity and Insensitivity (A misapplication of the treatment-control design in a national evaluation). Educational Evaluation and Policy Analysis, 4 (3):261-279. Fetterman, D.M. (1982). Ethnography in Educational Research: The Dynamics of Diffusion. Educational Researcher, 11 (3):17-29. Also reprinted in Fetterman, D.M. (Ed.) Ethnography in Educational Evaluation. Newbury Park, CA: Sage Publications, Inc., 1984. Fetterman, D.M. (1981). CIP is Hip: A National Ethnographic Evaluation of an Alternative High School Program for Dropouts. Doctoral dissertation, Stanford University. Fetterman, D.M. (1981). New Perils for the Contract Ethnographer. Anthropology and Education Quarterly, 7(1):71-80. Fetterman, D.M. (1981). Protocol and Publication: Ethical Obligations. Anthropology and Education Quarterly, 7(1):82-83. Fetterman, D.M. (1981). Blaming the Victim: The Problem of Evaluation Design, Federal Involvement, and Reinforcing World Views in Education. Human Organization, 40(1):67-77. Also reprinted in Evaluation Studies Review Annual, 1982, 7:65-75. Fetterman, D.M. (1980). Ethnographic Techniques in Educational Evaluation: An Illustration. In A. Van Fleet (Ed. ), Anthropology of Education: Methods and Applications. Special topic edition of the Journal of Thought, Fall, 15(3):31-48. Fetterman, D.M. & Alvarez, R.R. (1979). Anthropological Approaches to Evaluating Education: An Ethnographic Guide for Program Evaluation. CA: United Teachers of Santa Clara Press. Fetterman, D.M. (1976). An Urban Secondary School Ethnography. Storrs, Connecticut: University of Connecticut.